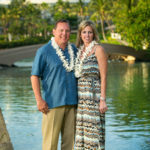 Had the pleasure of photograph a wonderful family at Kukio Beach just north of Kona town on the Big Island of Hawaii. They did a combination of maternity and family portraits in one session. The family chose a morning session to get great blue skies and blue water. With an hour session the Mom was able to do a couple of different outfits changes, and Kukio is a great location with a bathroom near by.